'Hymns are prayers in our pockets', writes Pam Rhodes, expressing how hymns help us to respond to God. Pam brings together 40 recordings of her favourite hymns. Drawing on her experience of presenting Songs of Praise, these recordings encourage us to express our joys and sorrows to God, and ultimately find a hope and inspiration within their poetic verse. Whatever our circumstances, these hymns turn us again to the God who created, knows and sustains us with that 'love so amazing? described in the immortal words of hymn writer Isaac Watts. 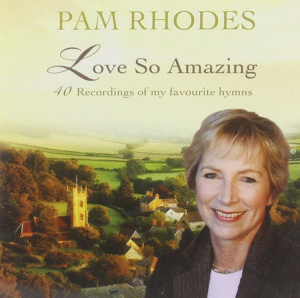 Pam Rhodes has presented the BBC's Songs of Praise for many years, and loves hymns, both old and new. She has also written numerous novels, including With Hearts and Hymns and Voices and The Dunbridge Chronicles. Pam Rhodes Love So Amazing 2CD by Various Artists was published by Elevation in December 2016 and is our 2523rd best seller. The ISBN for Pam Rhodes Love So Amazing 2CD is 5021776205937. Be the first to review Pam Rhodes Love So Amazing 2CD! Got a question? No problem! Just click here to ask us about Pam Rhodes Love So Amazing 2CD. Just purchased the new Pam Rhodes cd from you ..Could you tell me if the cd Love so Amazing ...contains lyrics ? Can you tell me if the recordings are music only, choirs, solos? Do you know who is singing/playing on the tracks? Couldn't play any samples.